Submitted by Benjamin Kraft, Bryce Corlee, Courtlan Roland, Zachary Connor, Nicole Palmeter, Lindsey Hamilton, Sofia Buscarini, and Cameron Owens. When studying Islamic intellectual history, Nasir al-Din al-Tusi is a prominent figure with numerous accomplishments in a range of different topics. From philosophy to mathematics, his achievements set the basis for numerous concepts used in our current everyday life. His greatest accomplishments could be said to be in the fields of astronomy and mathematics. Nasir al-Din al-Tusi’s life, works, and achievements are what make him such an important figure in Islamic history. Nasir al-Din al-Tusi is pictured at his writing desk at the high-tech observatory in Maragha, Persia, which opened in 1259. He persuaded the Mongol conqueror Hulaga Khan to build the facility. Muhammad ibn Muhammad ibn al-Hasan al-Tusi, also known as Nasir al-Din al-Tusi, was born on February 18th, 1201 in Tus, Khorasan, which is in modern day Iran. Al-Tusi’s father was a jurist at the Twelfth Imam School in Tus where al-Tusi received his education. The school was mainly a religious institution, but he was also taught logic, physics, metaphysics, algebra, and geometry by his uncle. At the age of 13, he moved to Nishapur, an important learning center, during Genghis Khan’s move through the west. There he studied philosophy, medicine and mathematics. Around 1220, when Khan began to move back to the east, al-Tusi was invited to join the Assassins, a group that focused on an intellectual form of extremist Shi’ism, and became a well respected member of the Isma’ili court. Aside from his contributions to the natural sciences, Al-Tusi also made various contributions in poetry and in writing. Al-Tusi composed around 150 known treaties and letters spanning multiple languages, which contributed heavily to the spread of his many works (Gillispie, Coulston, Holmes 2008). Perhaps considered to be one of his most influential works according to Gillispie, Asās al-iqtibās (“Foundations of Inference”), one of his five books of logic, was one of a few works originally written in Persian. In addition, al Tusi published a book of philosophy on ethics, “The Book of Directives and Remarks”, which is one the best known works of its kind in the Persian language according to Gillispie. 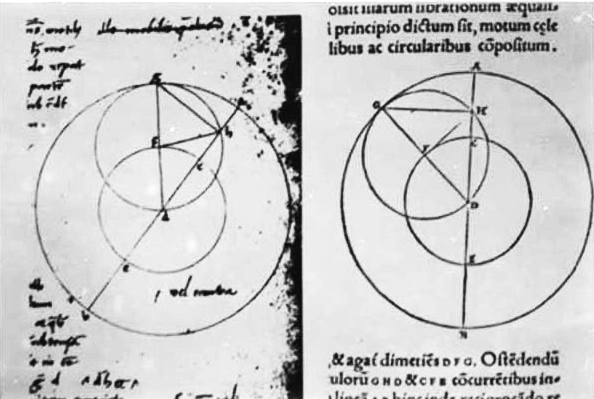 A comparison of the Tusi couple (on the left), and a mathematical model from Copernicus. 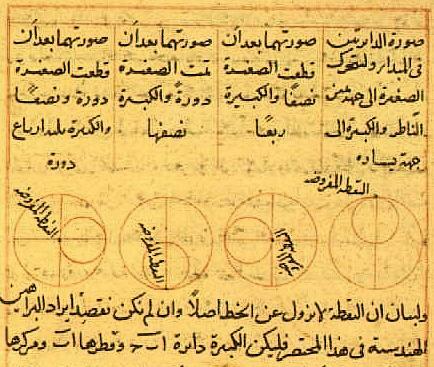 In all, Al-Tusi was a well rounded and highly intelligent scholar, contributing much to the fields of mathematics, physics, astronomy, and philosophy, while also contributing to the arts with his poetry. His influential works, including various political treaties, served to spread his influence outside of the Islamic world. His ideas have placed him as one of the most prominent Islamic scholars in history. The Tusi-couple is a mathematical device invented by Nasir al-Din al-Tusi in which a small circle rotates inside a larger circle twice the diameter of the smaller circle. Rotations of the circles cause a point on the circumference of the smaller circle to oscillate back and forth in linear motion along a diameter of the larger circle. Wikimedia Commons. Animated Tusi couple. Wikimedia Commons. Gillispie, Charles Coulston, Frederic Lawrence Holmes, and Noretta Koertge.Complete Dictionary of Scientific Biography. Detroit, Mich.: Charles Scribner’s Sons, 2008.